Two West Linn High School teachers received prestigious awards this month for their work in and out of the classroom. Matt Kellogg received the 2018-19 Civic Educator of the Year Award from Classroom Law Project — an Oregon nonprofit organization that provides professional development opportunities for teachers while teaching students to become active citizens. 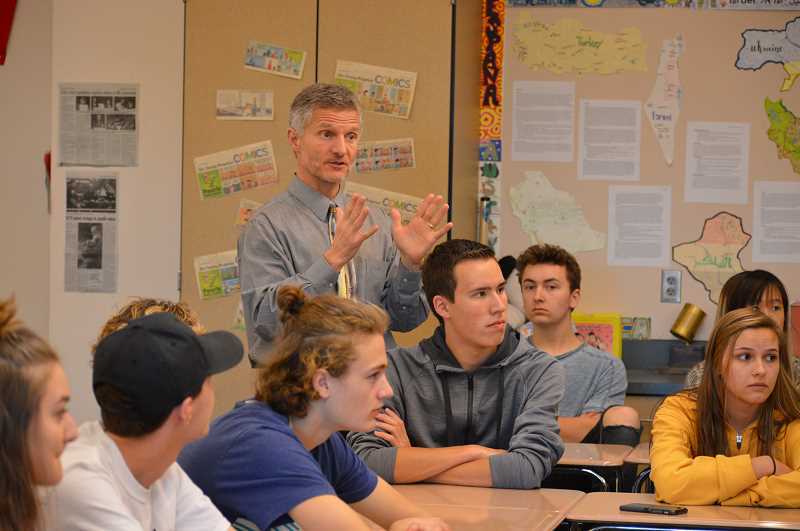 Todd Jones was selected by the Oregon Department of Education as runner-up for 2019 Oregon Teacher of the Year — a program that identifies superb educators. "I think part of what makes them so good at what they do is that they expect, and work to instill in their students, a sense of responsibility and integrity," said junior Kaiden Randall, who's taken Kellogg's honor's law class and Jones for AP government. "That's something a lot of kids just don't grow up with. They do everything based off of how others will react. Not because they think it's right or because they want something better for themselves. It's sad." In May, the Oregon Department of Education, in partnership with the Oregon Lottery, announced 13 regional winners for the Oregon Teacher of the Year award. As a regional winner Jones, who was selected for the Metro region, was automatically in the running for the 2019 Oregon Teacher of the Year. Applicants for the program were nominated and then submitted testimonials and letters of support from various colleagues. Applicants also answered prompts including topics about improving school culture and connecting students to the community. The nominees were assessed on leadership, instructional expertise, community involvement, understanding of educational issues, professional development and vision by a panel of regional representatives. The Oregon Department of Education selected four of the 13 regional winners to be interviewed and announced the winners in December — Churchill High School health occupations educator Keri Pilgrim Ricker took the title, but Jones was close behind. "I'm deeply honored because there are countless, in my opinion, teachers worthy of this just in this building alone," said Jones, who teaches government and history at WLHS. Jones said talking about why he deserved the award during the interview process was somewhat awkward, but he enjoyed talking about how proud he was of his students and the work they do. "We talked about the work we do in the classroom where we are focused on not just learning content, but skills that will benefit us long after we leave West Linn High School," said Jones, adding that he's instructed students to advocate for issues that are important to them. "I'm proud to give kids meaningful experiences outside of our walls." Randall said Jones' government class changed him for the better. "Not only does he teach the curriculum, he teaches principles, things like honesty, responsibility and integrity," Randall said. "He doesn't teach kids to recite, he teaches kids to be decent, caring, critical thinking, good people. I won't soon forget the time where he took just a moment to talk with us about integrity, what it means and why it's so important to have." And on Dec. 3, ODE officials and a representative from the Oregon Lottery surprised Jones during his AP government class by announcing his award and presenting him with a $2,000 check. "Obviously the distinction is a great honor but my commitment is to continue to be the best teacher I can be (and) continue to support kids in realizing their full potential," Jones said. "It's not going to change how I teach in anyway." 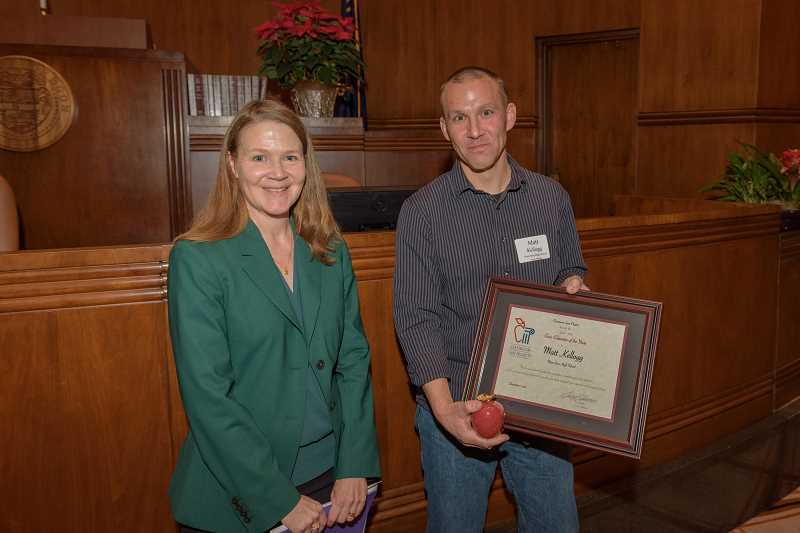 On Dec. 7, Oregon Appeals Court Judge Erin Lagesen presented Kellogg the Civic Educator of the Year award at the state capitol during the Oregon Civics Conference, which allows educators to participate in workshops and learn from experts. Kellogg, who teaches AP human geography and two law courses, has taught at WLHS for 23 years. He has also coached Mock Trial for 20 years, and has helped lead the successful team to regionals and state. One year, the team even placed seventh in the nation. Senior Wallace Milner has had Kellogg as a teacher for honors law and AP human geography and sees him as deserving of the recognition. "My freshman year, I was incredibly nervous about taking AP classes. Memorizing hundreds of terms and understanding complex social and political theories seemed incredibly daunting," Milner said. "Mr. Kellogg managed to make the class not just engaging and informative, but incredibly fun." Last year, Milner took Kellogg's law class. "Before his time at West Linn, Mr. Kellogg worked with incarcerated inmates, helping them to earn their GEDs," Milner said. "His passion for creating a system that helps everyone would often show through in his teaching, and his real life experience made him an expert on the subject." Milner also values that Kellogg emphasizes debate and discussion in his classes and provides students with the skills to form and voice their opinions. "Personally, I can say that the concepts I learned and the conversations I've had in his classes were incredibly influential in helping me develop my worldview and ambitions," Milner said. "I'm sure most of his students would say the same."